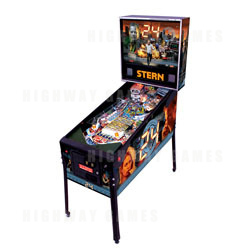 Stern is set to release their latest Pinball machine, 24. The pinball takes its theme from the popular television series starring Keifer Sutherland, and will begin shipping February 2009. The machine incorporates thematic elements from the television show, which follows US Government counter terrorist worker Jack Bauer as he fights domestic terrorism threats. The machine includes speech as heard in the television show, as well as original speech by Mary Lynn Rajskub, who plays Chloe. The 24 pinball machine was designed by Steve Ritchie, with the playfield featuring a suitcase that holds and releases pinballs for multi-ball play, a sniper house that opens to reveal a bullet-spraying terrorist, and an exploding safe house that you can shoot the pinball into. Gary Stern says, "24 is the hottest show on television right now, and our game lives up to its reputation. 24 is both challenging to the expert player and easy to understand by the casual player. We are very proud of this game."